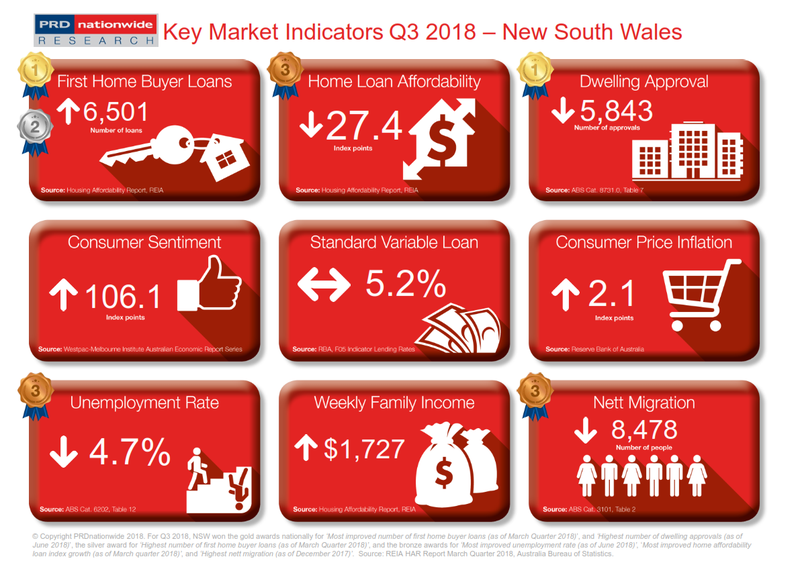 New South Wales is market leader for most improved number of first home buyer loans, earning the gold award nationally for three quarters in a row. There are three potential explanations for this. Firstly, for the first time over the past 24 months, both NSW capital city (i.e. Sydney) and NSW metro house median price declined over the past 12 months to 1st half 2018, by -11.1% and -8.7% respectively, as quoted in the PRDnationwide Australia Economic Property Report 2018. A cooling in property price suggests increasing home loan affordability index reading, which was true for NSW as the index sat at 27.4 points in March quarter 2018. This is higher than the 26.5 index points home loan affordability index reading in December quarter 2017. Secondly, NSW has climbed from a silver to gold award nationally in the highest number of dwelling approvals category, with 5,843 approvals (previously 5,644 in Q2 2018 Key Market Indicator). Thirdly, NSW has retreated to bronze award nationally (from silver) in the highest nett migration category, recording only 8,478 people moving to NSW as of December 2017. This is quite a significant drop compared to Q2 2018 Key Market Indicator nett migration figures, of 23,124 people. Combined, these factors contribute to a higher level of housing supply in NSW, however with less demand from nett migration. This creates more property stock and increased price affordability, great news for first home buyers wanting to enter the market.